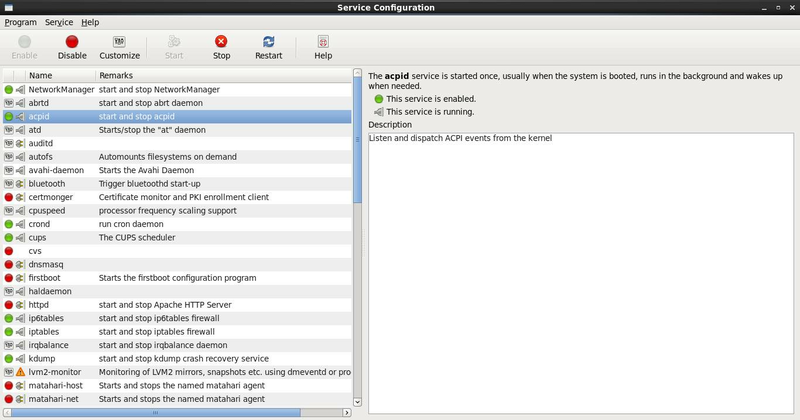 The Red Hat Service Configuration tool is used to start a service that hasn't been started, or to make sure a service starts automatically at the moment your server boots. Managing a server is all about managing services. That means that you need to be able to verify the current status of a server to see if it is running or not, and if it is not, you need to make sure that it becomes available again. To do this, Red Hat provides the Service Configuration tool that you can find in the System > Administration section of the graphical interface. All services on Red Hat are managed through their service scripts. To make sure a service starts when your server is booting, the service script should be launched automatically, and if it hasn't been started automatically on boot, you should be able to launch it manually. This is the essence of what the Service Configuration utility does. From the Service Configuration tool you can make sure that all services you need are started automatically when your server boots. To determine when a service should be started, the concept of runlevels is used on Linux. A runlevel defines a status in which your server normally boots. For example, the normal runlevel for a server that boots a graphical environment, is runlevel 5, and the normal runlevel for a fully operational server that doesn't boot into a graphical environment, is runlevel 3. Special runlevels exist as well, such as runlevel 1, the so called “single user mode” used for troubleshooting. Normally, each service is programmed for which runlevel it should be started in, and when it shouldn't. 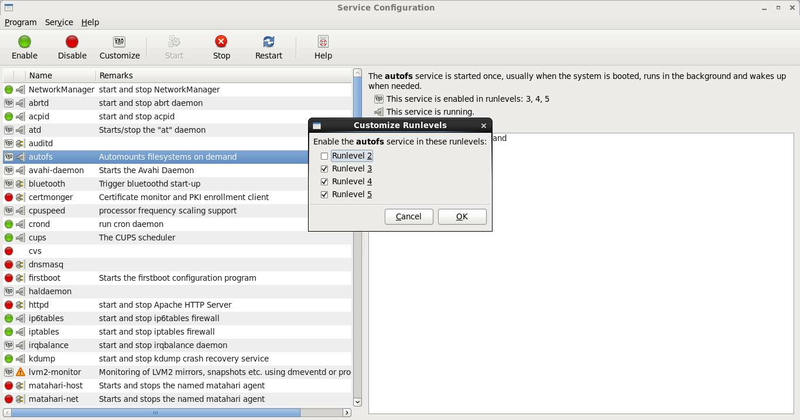 The Service Configuration tool takes advantage of this: if you enable a service to start automatically, it will automatically start in all runlevels where it is supposed to start. But, you can select a specific service and click “Customize” if you don't want to use the default settings. From there you can specify the specific runlevels the service should be available in. But this is not something that you should do under normal circumstances. Use Customize if you want to modify the default availability of selected services. By enabling a service, you specify that it should be started automatically when your server boots. By doing this, you don’t change the actual status. That is: if it wasn't running at this moment, you won't start it by clicking “Enable.” If you want to start a service that's not available, you need to select it and click “Start” from the menu bar. Similarly, if you want to stop a service that is running at the moment, select it and click “Stop.” Using the start and stop options may not give you the desired result, some services need a minimal configuration before they can be started. If a service refuses to start, you often have to dive into its configuration options to create the required configuration. For a hint, click the service for a short description, which may give an idea of where to go to create the further configuration. But, often the description is short and you'll need to consult additional resources.